Nickel Art was started by Peter Nicholl in 2005 after dinner one night, when a friend got fed up hearing Peter complain about "Credit Card Corners" and if it annoyed him so much why did he not do something about it. The result was that Peter went out the next day and started a framing business, Nickel ART. Today Nickel Art are a small family run business offering high quality custom picture framing in Belfast and Northern Ireland. They have a wide client base of artists, galleries, private collectors and institutions. What makes Nickel Art so different? 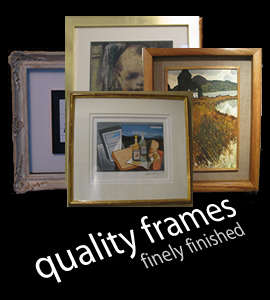 We specialise in providing art and picture frames that don't come apart in the corner, using unique joinery techniques instead of under pinners to craft each bespoke frame. This technique, and the high quality materials we use, are what differentiates us from standard picture framing companies. Hand paint, gild, and spray paint. Design Perspex Boxes; Aluminium frames etc. For Art Works. Wash lines for water colours. Stock and distribute Anti-reflective & Museum glass. Stock a picture hanging system for home/office/gallery. 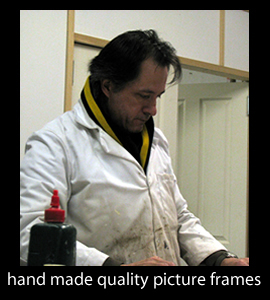 Have access to picture restoration, Oils and watercolours. Offer a crate making service for shipping works of art, along with organising shipping around the world. 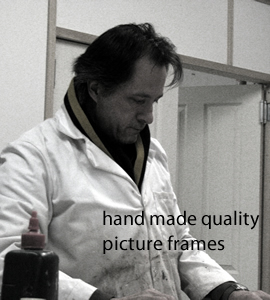 Restore old and damaged Frames / Mouldings.